Embiid Publishing was an early e-pub company which started back in 2000. They published some midlist SF and Romance titles, most famous probably being Liaden series by Sharon Lee and Steve Miller. They offered nice prices ($5 in average), and free sampler bundles. At first their books were Windows-only, later they started to offer Rocket format and a book reader for Palm OS. In 2006 the company closed doors, leaving customers with books they could not convert. 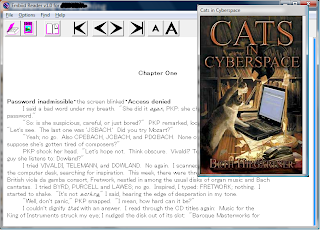 The Windows reader program could read two formats: UBK and EBK. The former was slightly scrambled but could be read by any reader. The latter was encrypted with a personalized key and could only be read by the personalized reader executable downloadable with the first purchase. The Reader was written in Delphi and had pretty basic functionality: changeable font, bookmarks, navigation. While the file_seed is stored directly in the file, user_seed is calculated as Adler32 checksum of a 128-byte user ID, which is stored directly in the personalized EmbiidReader.exe. The text of the book uses a small subset of HTML tags for formatting, but the paragraphs are delimited by newlines, not <br> or <p> tags. Here's a small Python script to convert an Embiid book to HTML. A valid EmbiidReader.exe is necessary to decrypt personalized books. You will need Python to run it. You should get a <book.html> file with decoded text. I am a newbie and also have Sharon Lee and Steve Miller Embiid books and would love to convert them to HTML. How do I use the script to decode them? Hi, I'm trying this but I can't find EmbiidReader.exe in my computer, where should it be located?? I can't find it for download on internet either, seems the publisher closed doors, so what can I do? I'm still able to watch the ebook, so it must be using soe program to view it, right?? thanks. @Anonymous: download Process Explorer from TechNet, run it and look for EmbiidReader.exe in the process list. Double-click it to see the full path to the exe. Hi Igor, no luck finding embbidreader. The ebook is actually an exe (Ebook Pro) so I'm not sure how it works and there is no trace of it using embiidreader when I open it. I got the the ebk file from a temp folder created when the ebook is opened, and copied it to the same folder as the python scrypt but am still missing embiidreader. Thanks. I try your instructions but I can't find EmbiidReader.exe. How can I get it? My script only works for Embiid books. If you don't have EmbiidReaderrexe, your book is probably not from Embiid.